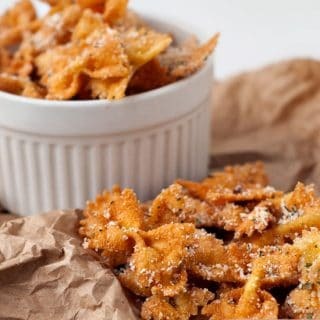 Bowtie Pasta Crunchies– I think you’d agree that sometimes you just need something crunchy and salty and fried. Am I wrong? I mean, you could argue that nobody reaaaally needs fried food in their life, but I’m not the right person to have that argument with. 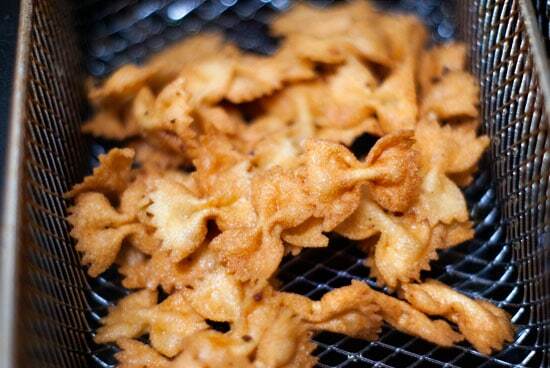 I’m all about moderation and all, but in the case of these bowtie pasta crunchies, there will never be enough. Okay guys, we’re frying pasta today and it’s amazing what just plain ol’ cooked pasta turns into once it hits that oil. 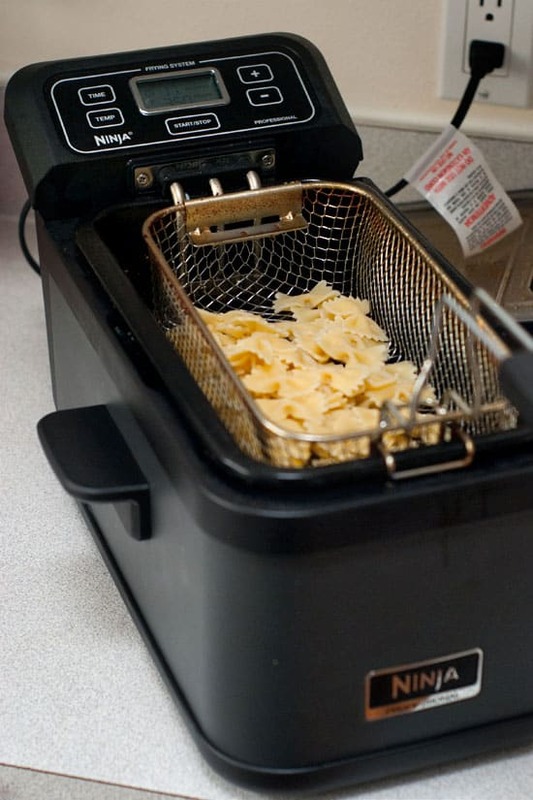 pasta can be fried on the stove top in a few inches of oil, but today it’s hitting the oil in a Ninja Professional Frying System that I was sent to review a while back. 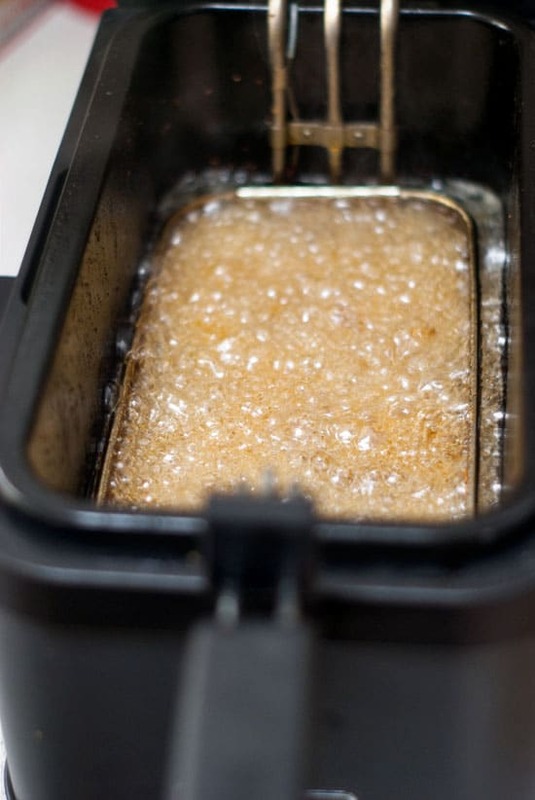 We’ve actually been using this fryer for the past 3 months or so and we love it. You can probably tell by fact that the basket is not exactly in super pristine condition that we’ve put it to good use, too. It’s been my best friend as my pregnancy cravings started calling for crispy mozzarella sticks and hot french fries dipped in super pickle-y fry sauce and my husband actually took it to school with him and made some new friends. Yeah, he cooked his classmates tater tots one morning to have during lecture and found that it’s really easy to transport. So if you’re looking into new ways to gain the favor of co-workers, this just might be the fryer for you. 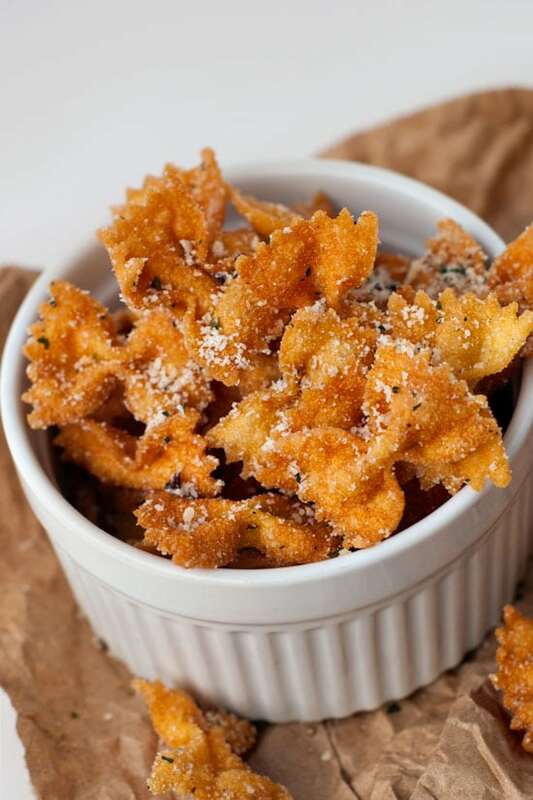 All we’re doing with these bowtie crunchies is giving them a little dunk in the oil for 3-4 minutes. It’s hard to see in this picture, but the frying basket actually has a lid that keeps the food emerged in the oil so that you don’t have to flip it. Pretty awesome. 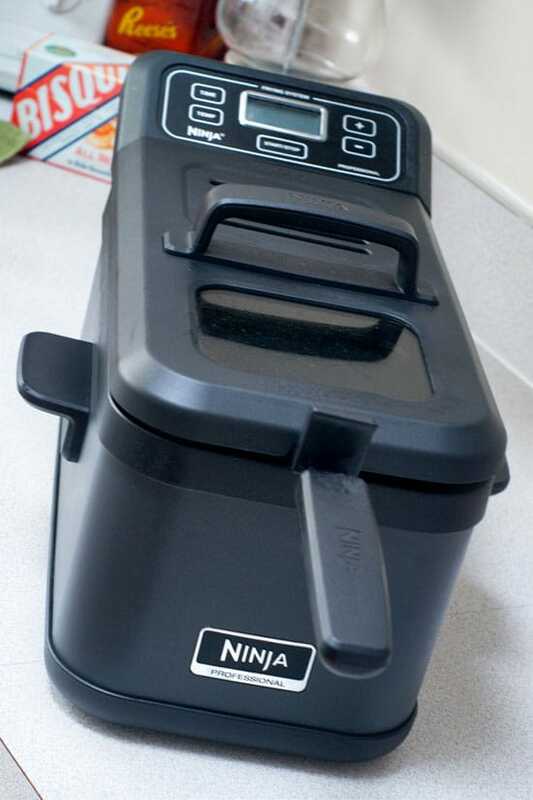 Previous to trying the Ninja, we once had a cheap counter top deep fryer that left our food soo greasy and took forever to cook anything. The culprit of this problem was that it didn’t have a built in thermometer to keep the oil regulated at a constant temperature. I once measured the temperature of the oil when it was set on “high” and it was only about 300 degrees– definitely not hot enough to cook anything efficiently and quickly! 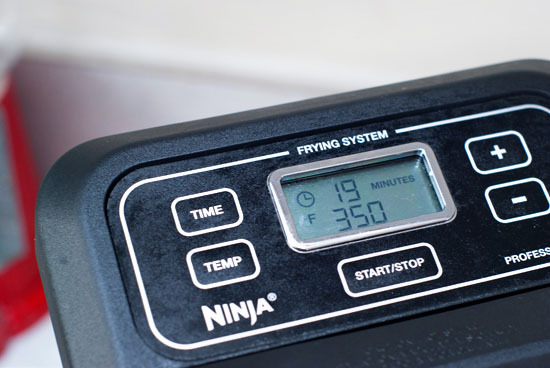 What I love about the Ninja is that it keeps the oil at the temperature you set while frying so that your food cooks quickly and has the least chance to absorb any more oil than is necessary. We also love that it is a breeze to clean up! When you’re ready to change out the oil the oil reservoir, basket, and lid are all dishwasher safe. Plus it comes with a pour spout which makes emptying the oil super easy. So basically what I’m saying is that I couldn’t be happier with the fryer and definitely recommend it. Aaaand back to the crunchies! You know they are done when they are golden brown and beautiful. 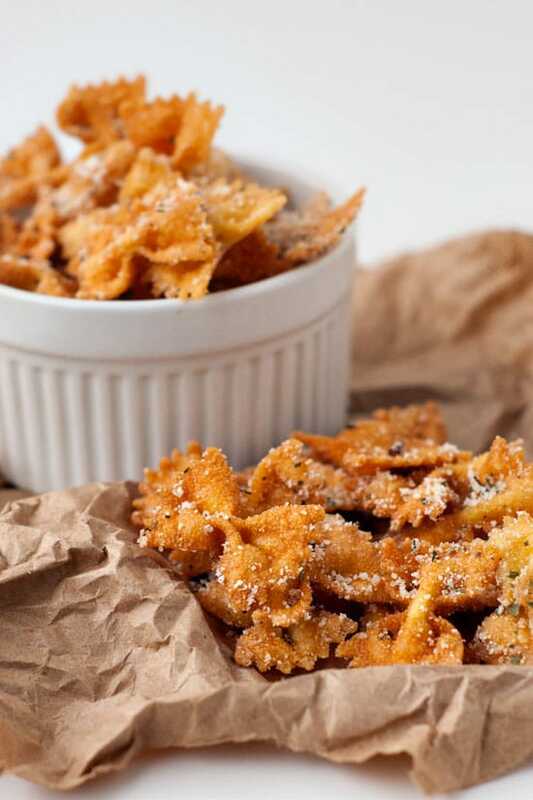 Season Your Bowtie Pasta Crunchies! 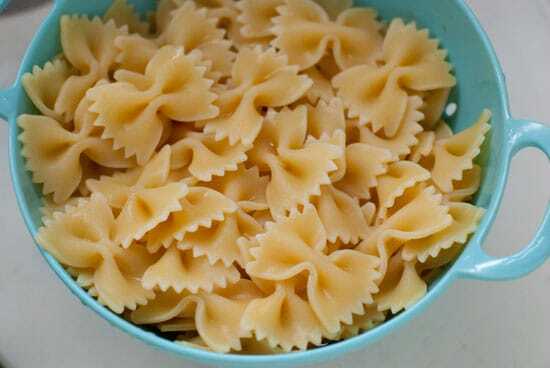 It’s important to season the Bowtie Pasta Crunchies as soon as they come out of the oil so that the seasoning actually sticks to them. 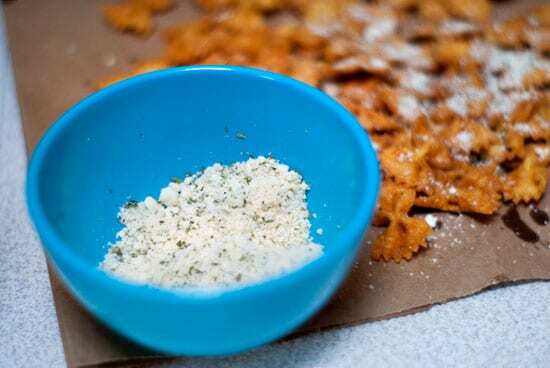 I like a mixture of grated parmesan cheese, granulated garlic, parsley, and salt. A little squeeze of lemon over the top is pretty irresistible too! Now really, could you resist these? Didn’t think so. Deep fry pasta at 350 degrees for 3-4 minutes or until golden brown. Remove from oil and immediately sprinkle with cheese mixture to season. Squeeze fresh lemon over the top if desired. As long as the noodles were cooked before frying they shouldn’t be hard to chew. Is it possible the oil could have been too hot and didn’t crisp them up all the way before turning brown? I’d say to check the oil temperature– you want it about 375 degrees. With fully cooked pasta and the right oil temp they should could out crunchy and delicious. Hope that helps! You probably forgot to precook the pasta! Love the recipe and plan to try it. But, I am also interested in the fryer. Is this the F301 model? Looking on Amazon and it seems that might be the same one for around $139.00?